In 2018, the minimum wage was increased in 13 states and the District of Columbia through legislation or referendum. In eight more states, the minimum wage increased automatically because it is indexed to inflation. These changes came on the heels of other minimum wage increases in many of the same states over the previous few years. In fact, after three years of mostly only indexed minimum wage increases, there was a spate of newly legislated state-level minimum wage increases starting in 2014. When we compare states with any minimum wage change over the last five years with those without any, as shown in the figure below, the association between states with at least one minimum wage change and growth in wages for low-wage workers is quite strong. 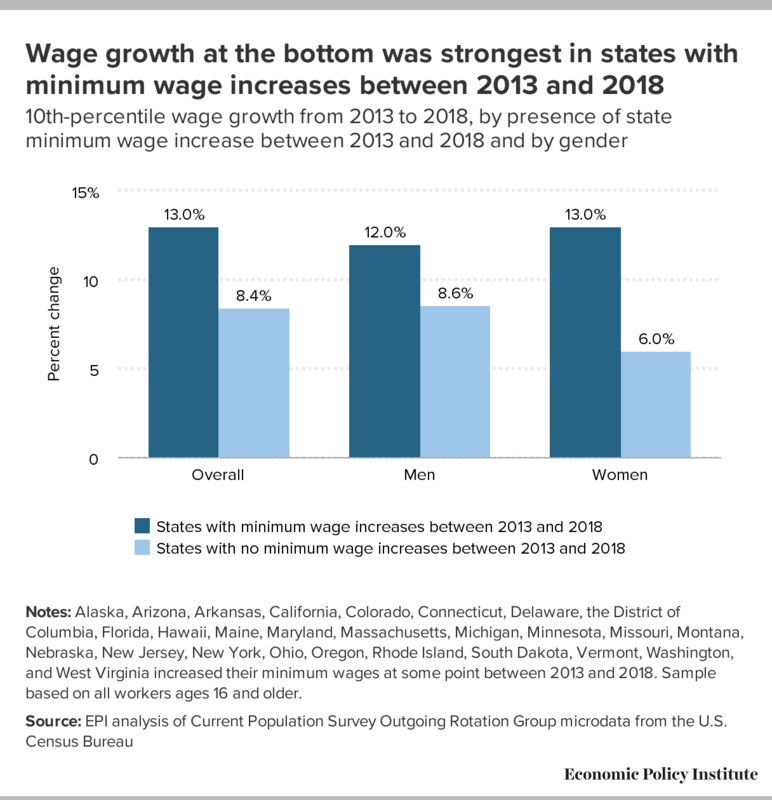 Wage growth at the 10th percentile in states with at least one minimum wage increase from 2013 to 2018 was more than 50 percent faster than in states without any minimum wage increases (13.0 percent vs. 8.4 percent). As expected—given women’s greater likelihood of being in low-wage jobs and thus greater likelihood of being helped by minimum wage increases—this result is even stronger for women (13.0 percent vs. 6.0 percent). However, men also experienced much faster 10th-percentile wage growth in states with minimum wage increases than in those without (12.0 percent vs. 8.6 percent). Notes: Alaska, Arizona, Arkansas, California, Colorado, Connecticut, Delaware, the District of Columbia, Florida, Hawaii, Maine, Maryland, Massachusetts, Michigan, Minnesota, Missouri, Montana, Nebraska, New Jersey, New York, Ohio, Oregon, Rhode Island, South Dakota, Vermont, Washington, and West Virginia increased their minimum wages at some point between 2013 and 2018. Sample based on all workers ages 16 and older. Raising the federal minimum wage to $15 by 2024 would disproportionately raise pay for women. Although men make up a slightly larger share of the overall U.S. workforce, the majority of workers who would be affected by a raise to the federal minimum wage (57.9 percent) are women. Raising the federal minimum wage would also disproportionately benefit black workers because they are overrepresented among low-wage workers and are less likely to live in states or localities that have passed a minimum wage that is higher than the current federal minimum. As a result, increasing the minimum wage to $15 by 2024 would mean a pay increase for 38.1 percent of all black workers.